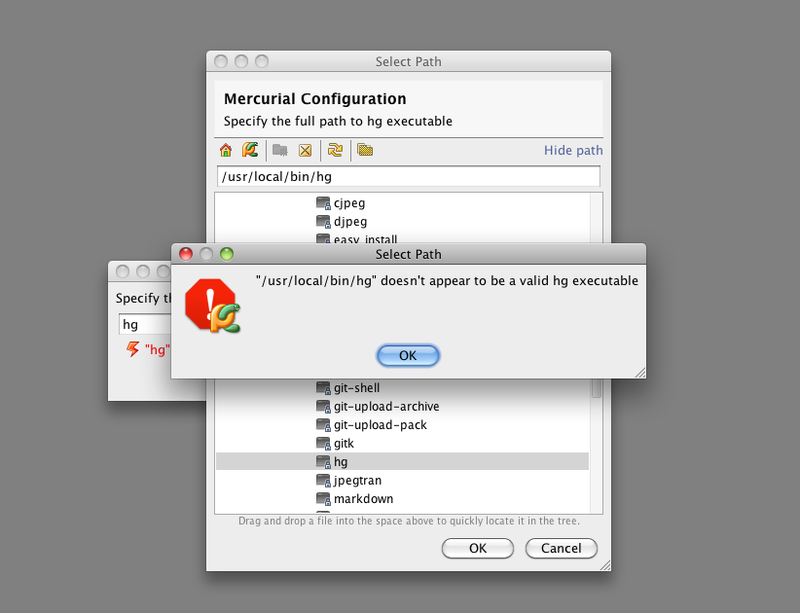 I'm using mercurial for a project, but PyCharm can't seem to find the right hg executable. According to "which hg" my hg executable is located at "/usr/local/bin/hg", but PyCharm says its not valid. Any suggestions on how to configure this correctly? Thanks. Michael, is this the dialog message you see? 1. It's name is 'hg'. 2. 'hg version' command quits without errors and returns a non-empty output (information about the current version actually). Could you please check if your hg satisfies these conditions? I'm pretty certain that's the correct executable since "which hg" also points to that file. Let me know if there's anything else I should try. Thanks for your help. It seems that there are some specific preferences (environment variables most likely) defined in your shell (in ~/.profile probably). They are applied when you run hg from the shell, but they are not visible from PyCharm. Because of that executing hg fails without these variables defined, which leads to the error you've seen. Or if you don't like to set the variables globally you may start PyCharm from a shell script and define the variables in that script. Anyway, may I see your configuration file please to check which configuration may be used by PyCharm users? Also, the article you linked is from 2001...are you sure it is still applicable to OSX 10.6? Thanks for your help. 1. define your PATH in environment.plist and restart IDEA - this should help to resolve your problem. 2. Temporarily disable all your .profile file (rename it for example) and try to execute /usr/local/bin/hg from Terminal - this should fail. I restarted PyCharm each time I changed the value, but got the same error every time. I may not be entering the values correctly, so let me know if I need to use a different syntax. So, according to the result of the second test we've recovered that the problem really is with some specific environment you have set in .profile. We're moving forward indeed, hope will solve the problem soon. But note that after you make changes in environment.plist you have to relogin the system so that it applies new values for environment variables. Did you do it? 1. 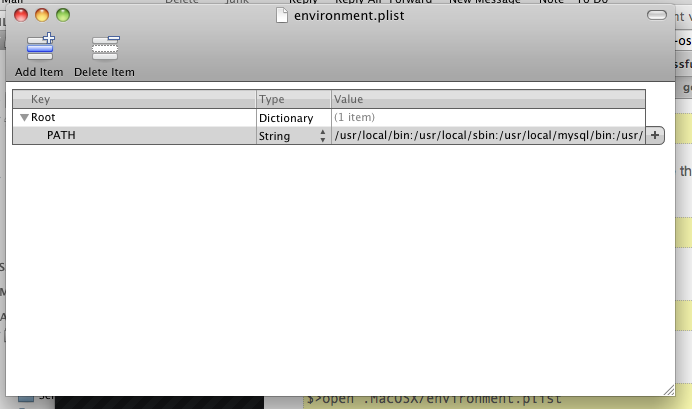 Set up a new variable in environment.plist. Something new which you don't have defined anywhere, like MY_TEST_VARIABLE. Assign any value to it. 3. Open Terminal and check if the value was assigned: echo $MY_TEST_VARIABLE should return value you've set in environment.plist. 2. repeat the steps above - but for real PATH variable and real value. 3. When you see that PATH is correctly visible by Terminal.app, though you didn't define it in .profile, it means that environment.plist settings were applied successfully. 4. Then you may start IDEA and check if it finds Mercurial. If everything succeedes, except step 4, then could you please provide the whole content of your .profile file here? Maybe it is not only the PATH variable.